Microgrids are highly localized distribution systems that connect one or more distributed energy resources (DERs) with multiple loads. They can operate independently from a larger utility grid, without service interruption, and are often used for extended periods of time. These systems are now breaking out of the pilot-application stage and becoming a more common presence on college campuses and military bases, in office parks and even in urban neighborhoods. For utilities interested in creating new relationships with their customers, microgrids offer an innovative approach to supporting local reliability while aiding their own efforts of demand-response, tariff management and emergency-recovery. Grid-connected facility microgrids serve single-owner facilities, such as a commercial building or corporate-owned data center, where main grid reliability isn’t adequate or where a utility is offering load-shedding price incentives or the possibility to save money on your energy bill thanks to time-of-use tariffs. Equipment and operations might be managed by an independent service provider. Grid-connected community microgrids serve multiple consumers and producers in such settings as multi-tenant business campuses, green villages and even small municipalities. Here, goals might include optimizing energy costs, boosting resiliency and integrating more renewable energy sources. District administrators manage these microgrids, maximizing consumption of locally produced energy and taking opportunity of the scale effect for negotiating participation in incentive and curtailment programs with electricity companies and third-party commercial aggregators. Off-grid facility microgrids are mainly developed by independent power producers, through bid-based contracts with both public utilities and private entities. Globally, this is the most common microgrid arrangement now operating, serving remote areas – such as military bases, isolated mines or industrial sites and off-grid resorts – where utility connections aren’t available. Off-grid community microgrids serve remote community and island locations, bringing together multiple assets – often including a high percentage of renewable solar and wind generation – to support vital community services. Today these systems often replace or supplement diesel generators, and so help to minimize fuel dependency, while also cutting costs and reducing pollution. The most common application domain is the rural electrification in countries who intend to rapidly develop access to energy. All these microgrid applications offer electricity companies new options for growing relationships with both new and existing customers. That pushes them to develop new customer-oriented service business models. In the end, it’s a win-win situation where utilities, prosumers and service providers work together to reach better outcomes: increased resilience, reliability, efficiency and sustainability. 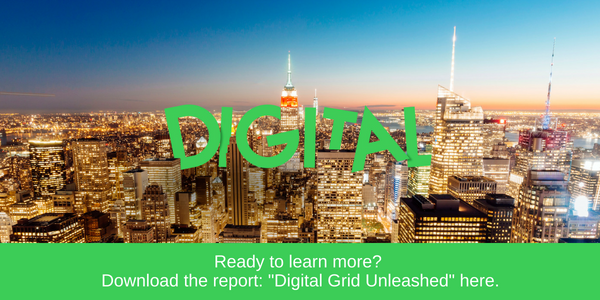 As Schneider Electric’s new report, “Digital Grid Unleashed” outlines, such a shift can pose new challenges – but it also presents new opportunities for growth. Download this report now to learn more about how utilities are responding – and succeeding – in today’s increasingly decarbonized, digitized and decentralized energy systems.